Glycolysis is a metabolic pathway that converts glucose into pyruvate. ATP is the key energy molecule for all biological organisms. One source of ATP is glycolysis, a series of reactions that breakdown sugars while producing ATP. Glycolysis is a series of 10 reactions that converts sugars, like glucose, into 3-carbon molecules called pyruvate. Glycolysis is an important pathway for cells because it produces ATP, and other products such as NADH and pyruvate, that can be used later to produce more ATP for a cell. 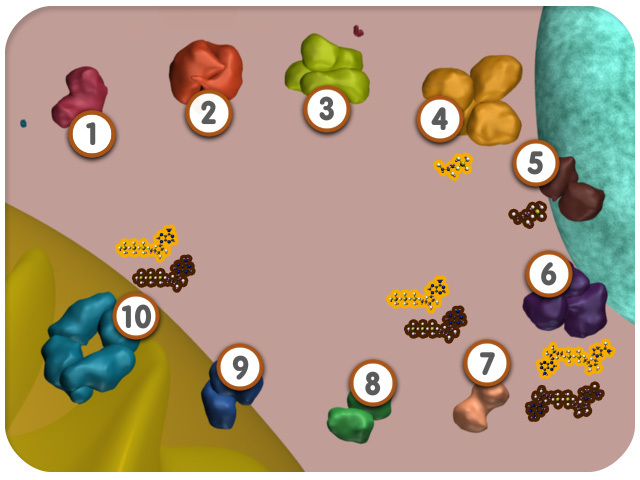 This key process takes place in the cytosol of the cell. 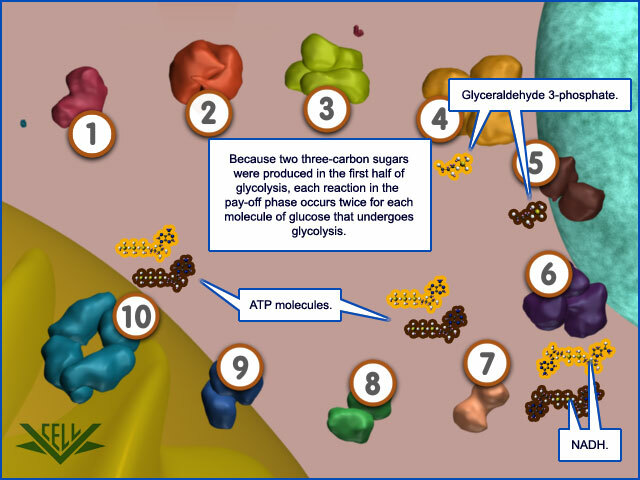 Let’s take a look at an overview of the key steps of glycolysis and focus on the input and output molecules. 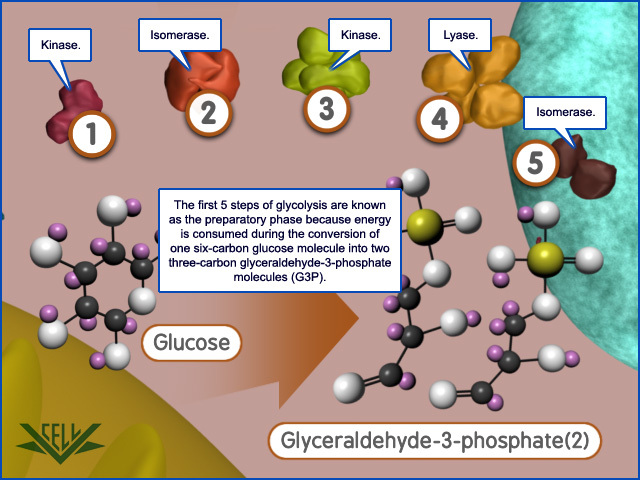 The first five steps of glycolysis convert a 6-carbon sugar (glucose) into two 3-carbon sugars (glyceraldehyde-3-phosphate). To do so, ATP is consumed in the first and third steps. Both of these chemical reactions are catalyzed by an enzyme known as a kinase, and both reactions are irreversible. 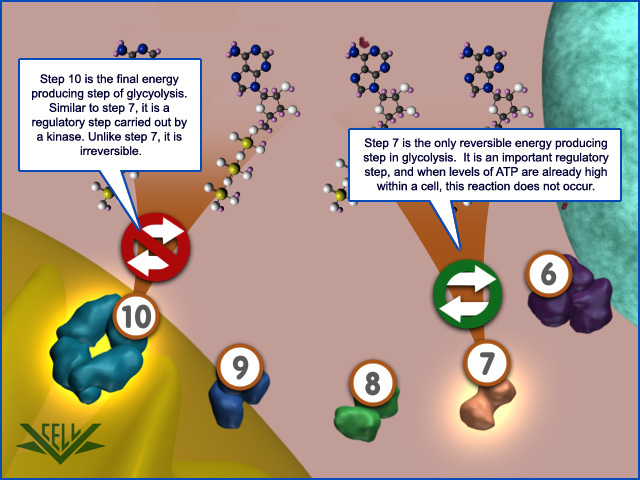 The next five steps of glycolysis produce energy. One ATP is made per glyceraldhyde-3-phosphate in both reaction 7 and 10. This means a total of four ATPs are produced in glycolysis. 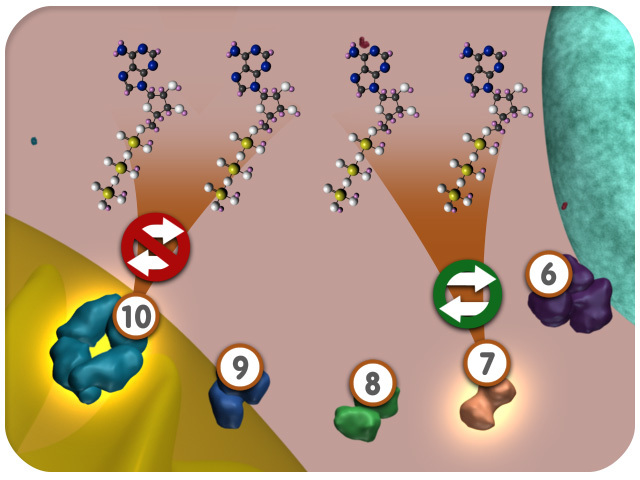 Both of these steps are carried out by a kinase reaction. Note, that step 7 is reversible while step 10 is not. 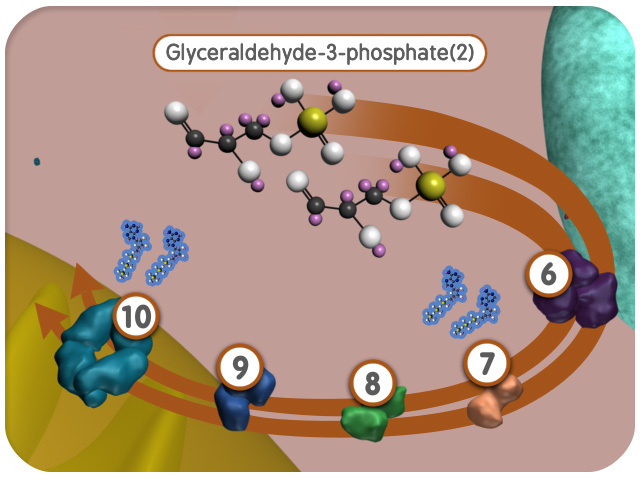 It is important to remember that the products in steps 6-10 are formed for each of the glyceraldehyde-3-phosphate molecules generated in steps four and five. This means that a total of two NADH and four ATPs are made in glycolysis. 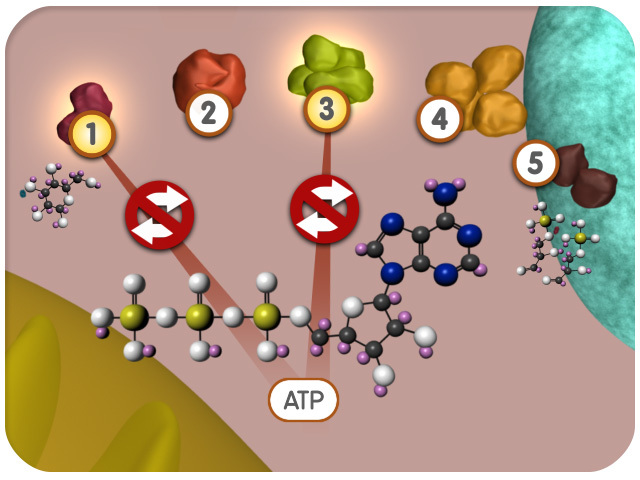 Because two ATPs were spent in the early steps of the pathway, glycolysis results in a net of two ATPs. There is one more key product of glycolysis to consider called NADH. NADH is formed in the sixth reaction by an enzyme called a dehydrogenase. 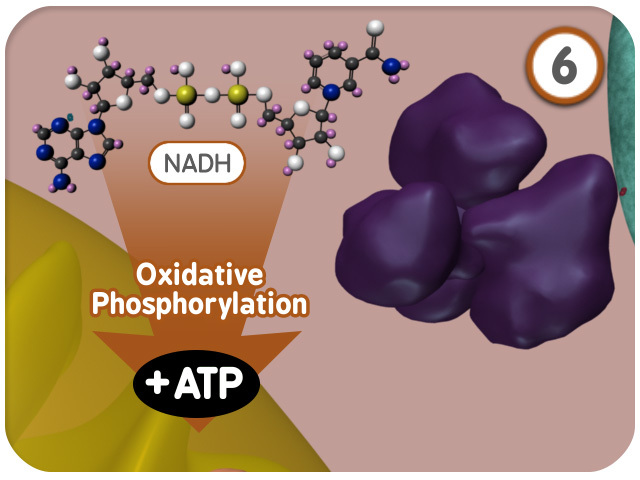 NADH is an electron carrier with the potential to produce more ATPs through a process called oxidative phosphorylation. 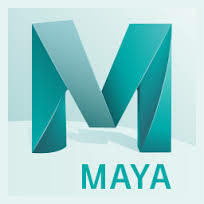 Details of that process are shown in a separate animation. As you can see, glycolysis is a process involving multiple enzymatic reactions that breakdown sugars. Its major contribution to biological organisms is the production of ATP which is used to drive many other biochemical pathways. 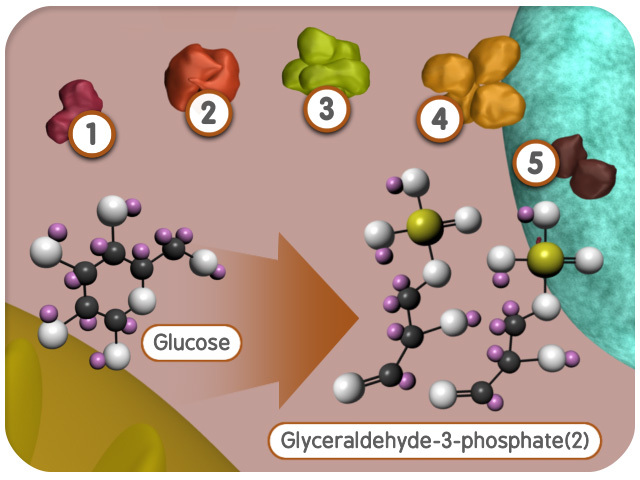 The first five steps of glycolysis convert one six-carbon glucose into two three-carbon glyceraldehyde 3-phosphate (G3P) molecules. 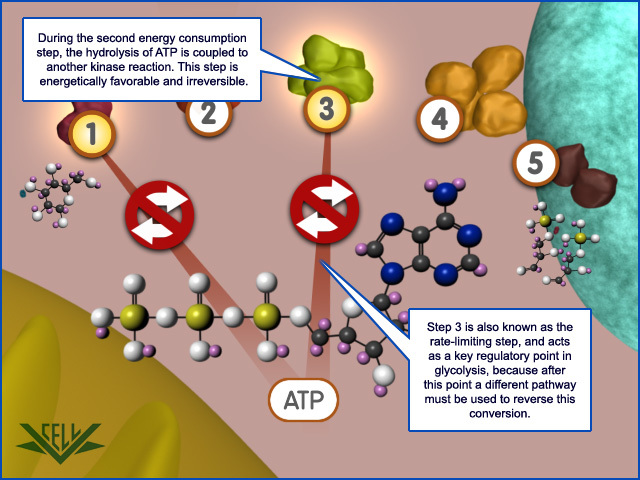 To complete this conversion, one molecule of ATP is consumed during step one and step three. Both of these reactions are catalyzed by kinase enzymes and are irreversible. Because the original glucose molecule is broken down into two G3P molecules, all of the reactions in the second half of gylcolysis occur two times. This results in two ATPs being produced at both steps 7 and 10. Step 7 is reversible, while step 10 is not. 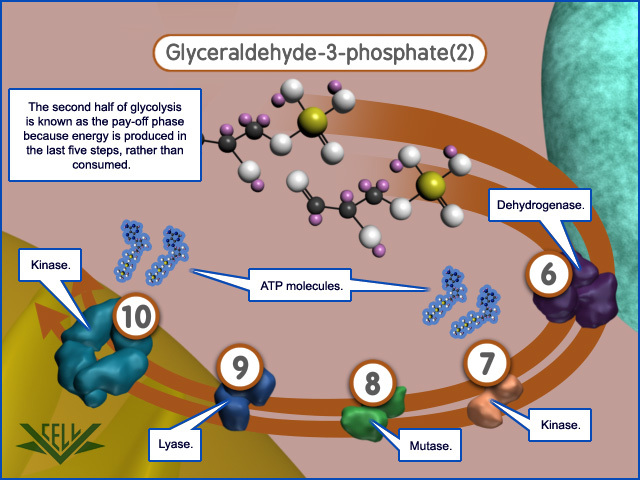 All of the compounds produced in the second half of glycolysis are made for each of the two molecules of G3P. 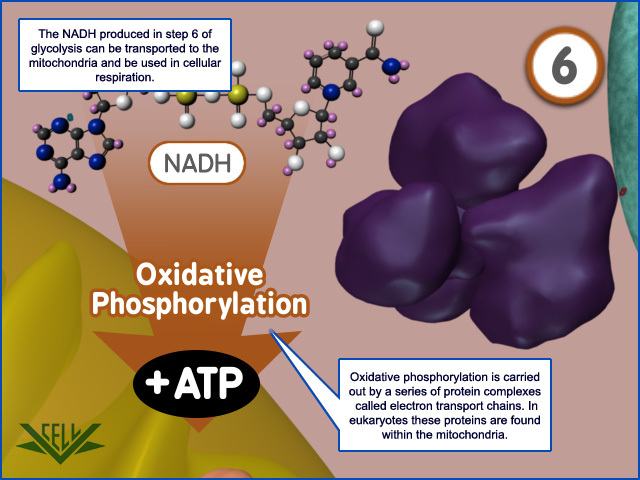 This includes ATP as well as NADH. 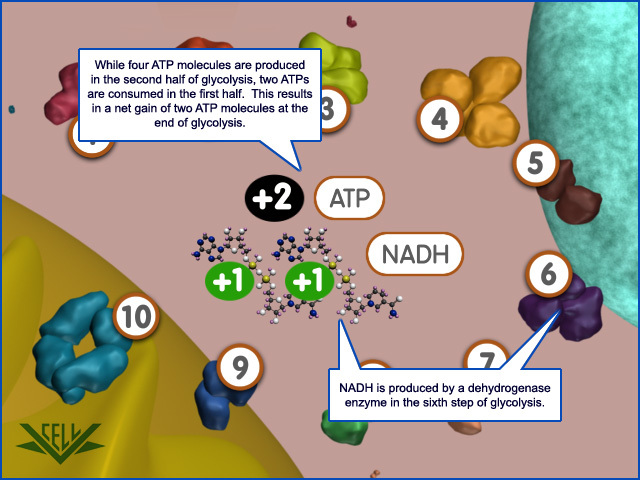 Because two molecules of ATP were consumed in the first half of glycolysis, and four molecules of ATP were produced in the second half, glycolysis results in a net gain of two ATPs. 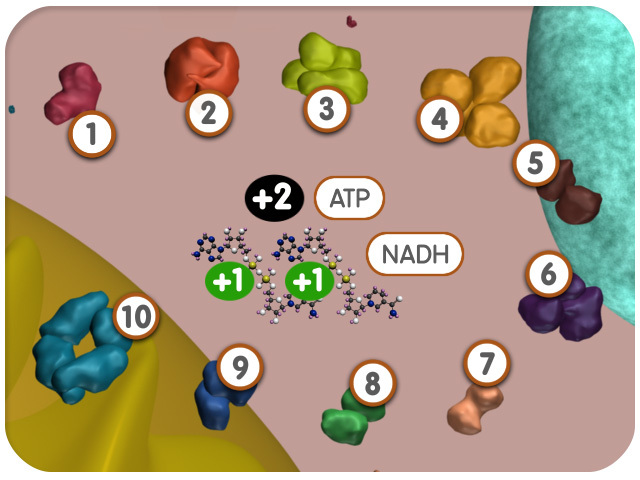 The NADH created in the second half of glycolysis can be used by other cellular processes such as cellular respiration to produce even more ATP for the cell.